Professional Marketing Courses after your Commerce Graduation. Hi friends! Just now you completed your B.Com, BBM, BBS, BMS, BBA, BA (Commerce) or their Masters equivalent. Waiting for your university degree certificate. Meanwhile, do you know there are some professional marketing courses that can be done in 1 or 2 months? So what? Just now you spent your money on a degree course. No more again. Yep, I understand. But it is important to have a certificate in professional marketing courses. What worth will that be for me? It will help you set foot in a career in marketing easily. Won’t my degree courses be enough for that? Not fully though. You need to have a professional certification. This is especially important for online marketing jobs. Companies look for key marketing traits while you apply for a marketing position. Some of those skills are, SEO/SEM, social media marketing, content curation and creation, email marketing, or more. Furthermore, there is a saying in Tamil, “Ilamayil Kal”, i.e., “Learn While You Are Young”. Moreover, another Tamil saying is, “Ilamaiyil Sombal Muthumayil Varumai”, i.e., “If You Are Lazy In Your Youth Days, You Will Suffer From Poverty When You Become Old”. Therefore, let me promise you, learning short term courses in marketing is really fun and one that guarantees you a job. 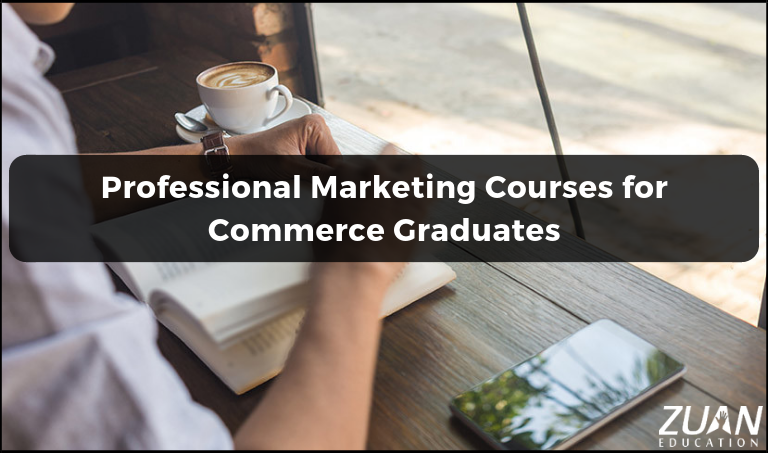 Let me help you skim through some short-term professional marketing courses that you can do after completing your commerce graduation. Therefore it is an important among professional marketing courses for commerce graduates like you. This professional education is offered by leading digital marketing training institutes in Indian cities. Significantly, doing this course will help you in core essentials like marketing strategy, customer experience, understanding digital channels etc. Earn using social networks like Facebook, Twitter, LinkedIn, Instagram etc. It sounds interesting! Eventually, build your goals using appropriate social media strategies, etc. With social media playing an important role in everyone’s life you can take the advantage of marketing through the respective networks. Therefore it is important among professional marketing courses. Therefore it is compulsory for you to learn SEO after your graduation degree. This will help you survive in the online market competition. Email marketing is very important among marketing plans. Analytics is the key driving factor of Digital Marketing. Therefore, it holds a prominent place among professional marketing courses. Tagging for online marketing etc. This is significant among professional marketing courses after your commerce studies. Instead of doing a diploma course you can do this PPC course and earn money quickly. Furthermore, you will be hired as a PPC expert with a high paying jobs in MNCs and corporates. Final thoughts. The above courses are equal to a diploma in professional marketing. Significantly, it may not be wise to do these courses through online learning or distance learning or learning from marketing cim or in a college of marketing. Therefore, it is best to learn these courses in a private IT institute to get hands-on training and other practical experience. Furthermore, you can also do a short-term course in content marketing. Markedly, these professional marketing courses add weightage to you resume. Significantly, you can bravely attend your face to face interviews and rightly claim your salary and job after learning these professional marketing courses.